Salt Lake City, July 12 – In celebration of the tenth anniversary of the DIY Festival®, West Elm returns to present Craft Lake City® workshops on-site during the three-day event celebrating Utah’s creative community. 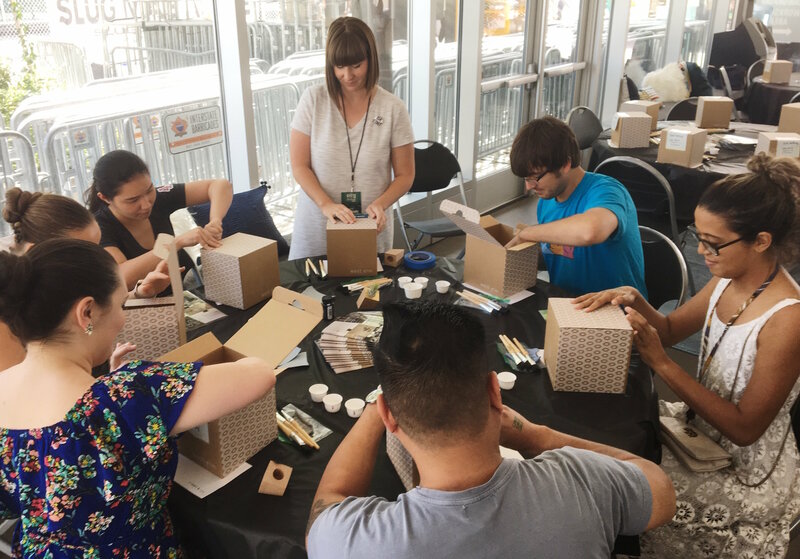 DIY Festival attendees will have the opportunity to enhance their festival experience by participating in a variety of hands-on craft workshops from August 10-12, 2018. Workshop participants will learn from top local makers and create their own contemporary DIY projects to take home. Pre-registration and a material fee for each workshop is required, and workshop tickets include single-day DIY Festival entry for the participant on the day of the workshop. Interested attendees may register in advance at craftlakecity.com/workshops. Local artist and DIY Festival participant Laura Muir will teach participants of all skill levels how to use drawing and painting techniques to make stunning negative space watercolors that connect to the natural world. Allison Milham of the Book Arts Program at the University of Utah will lead attendees through the fun and meditative process of Ethiopian-style bookbinding. Participants will make their own journals by using exposed sewing techniques, also known as a Coptic stitch. Artist Chris Blackburn will teach participants to use vintage processes to create beautiful cyanotype prints using foliage and foraged materials. Attendees will collaborate to make a large wall hanging, and then produce individual sun-printed cyanotypes on paper and fabric. Jewelry artisan Heather Leeflang will teach participants how to make sleek earrings by forming linear shapes from copper and brass. Leeflang will torch the metal prior to the workshop, and each attendee will drill, bend, and pound unique, handmade earrings to wear or share. In this workshop, illustrator and letterer Bre McCallum will teach participants the basic tools, strokes, and techniques used in calligraphy. Then attendees will make enviable envelopes and gorgeous greeting cards. Pamela Olson, owner of Native Flower Company, will bring her impressive professional experience and undeniable style to this workshop as attendees learn to design floral masterpieces from bold and beautiful seasonal blooms. Artisan Kirsten Moore of Freckle Face Collective creates eccentric, upcycled, and handmade pieces designed to enliven living spaces. Moore will walk participants through the fun process of mixing, molding and pouring a contemporary concrete plant holder to take home. West Elm has partnered with Craft Lake City since 2012 to curate year-round workshops in their City Creek location. Taking place once per month on Thursday evenings, the hands-on workshops are taught by Craft Lake City DIY Festival alumni, and provide attendees the opportunity to create objects for the home in an inspiring space. West Elm extended its partnership to present Craft Lake City workshops on-site during the DIY Festival in 2017, and will continue its support of the program at the 10th Annual DIY Festival in 2018. The 10th Annual Craft Lake City DIY Festival presented by Harmons and Mark Miller Subaru will take place on Friday, August 10 from 5 p.m. to 10 p.m., Saturday, August 11 from noon to 10 p.m. and Sunday, August 11 from noon to 7 p.m. The DIY Festival is held at the centrally located Gallivan Plaza in downtown Salt Lake City at 50 East and 200 South, and invites visitors to meet more than 250 Utah-based artisans and creatives including: Google Fiber STEM Building DIY engineers and tinkerers, craft foodies, vintage vendors, Kid Row youth makers, and performers on two different stages. More information is available at craftlakecity.com. About West Elm: Since it launched in Brooklyn, NY in 2002, West Elm has helped customers express their personal style at home. Their mission is threefold: 1) offer choice in products and services, helping customers create a home that tells their story, 2) build community with customers, collaborators and associates, connecting likeminded strangers through inspiration, conversation, events and activities, and 3) focus on consciousness and honest business practices in everything they do, from handcrafted, local products to supply chain transparency and sustainability. West Elm has worked with 100+ independent designers. Their limited-edition collaborations help emerging and established artists and makers reach new markets while preserving the integrity of their designs. West Elm City Creek is located at 51 Main St, Salt Lake City, UT 84111. More information is available at westelm.com.